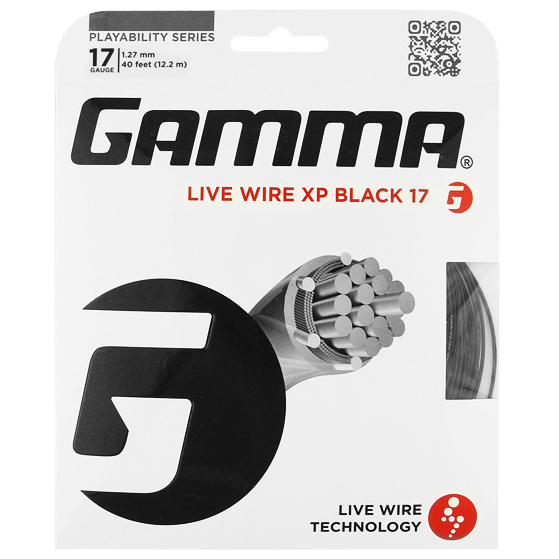 Gamma Live Wire XP 16 Black String - Tennis Town | 網球購物城 - Tennis Racquets, Equipment, Strings, Shoes & Bag. Now available in black! Offers a firmer "crisp" feel for natural gut-like playability. Zyex monofilaments added to the outerwrap provide increased durability and help reduce tension loss. Maximum power and control. Excellent durability. A crisp, solid feel. Using Gamma's exclusive Live Wire Technology the polymeric materials in the string are exposed to an advanced super high energy, Gamma irradiation process. This process energizes the molecules of the polymeric material, and accelerates the cross linkage (bonding) between the molecules by more than 25% to create Live Wire monofibers. The increased cross linkage provides greater dynamic resiliency and greater elasticity compared to all other synthetic materials. Offers a firmer "crisp" feel for natural gut-like playability. Zyex monofilaments added to the outerwrap provide increased durability and help reduce tension loss.